Some of the largest asset managers in the world collaborate using Calibre. The Calibre Process Builder lets investment teams share and leverage research, analysis and ideas in real-time. Collaboration is critical to superior performance, so why is it so hard? Research notes, investment ideas and financial models are often stored in a plethora of places. From network drives, research databases, in modelling software and on local machines. Analysts often have great difficultly in finding all their research for a particular security. This leads to inefficiencies that impact idea flows in real-time and ultimately impacts returns. Calibre Process Builder consolidates all your research into one, easy to use platform. Your ideas, your quantitative & qualitative models, broker feeds, ESG scorecards and company meeting notes are all available in Calibre. Your team are notified of changes to an item (such as a updated ESG scorecard after a management meeting) in real-time and across desktop, tablet and mobile devices. Portfolio Managers need a holistic view of each holding that transcends traditional quant snapshots. They also need a snapshot of all the qualitative aspects such management meeting notes and ESG scorecards. Current systems are often file servers and document management systems at best. Getting a snapshot view of 20 holdings becomes a tedious and time-consuming task. What is our view on the holding? 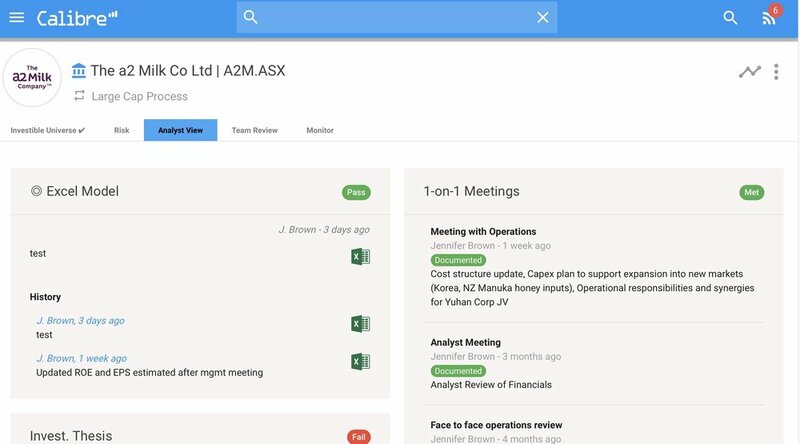 Where are all our meeting notes? What was our Investment Thesis and how has this changed over time? What is the current Economic Moat and how has this changed over time? What do current and past research for the security tell us? How was the ESG scorecard changed over time? Existing tools are highly productive for their specialised tasks. They are not pragmatic for the on-the-go demands of research teams today. Existing tools often don't function well on mobile devices. They are often slow and have user interfaces that are difficult to navigate. They often don't update in real-time across all devices automatically. This limits their usefulness and diminishes productivity when teams are on the road. Calibre Process Builder gives your entire research team on-the-go collaboration on phones and tablets (iPhone & Android). Mobile capability is available right out-of-the-box. Your technology team can focus on building your competitive advantage higher up the IT value chain. This avoids spending the time and money on building a commodity capability that can be acquired for a fraction of the cost of internal builds. Trying to find an analyst during reporting season is often challenging. Getting their most recent financial model or reviewing their updated Investment Thesis can be even more difficult, especially if the team are out of the office. Having to manually update or copy management meeting notes leads to diminished productivity. These information inefficiencies can lead to lost opportunities. Turn your information flows into an asymmetric advantage with Calibre Process Builder. Calibre gives you visibility on all the aspects of your research process, in real-time. So when your analyst takes notes during a management meeting, you will be notified and can review. When she then changes a key scorecard and the Investment Thesis as she travels back to the office, you will be notified in real-time. You can review on all the analysis, models and notes pertaining to the changes instantly and all on one platform. Most investment processes are still archaic. Excel and Word documents, research databases, files servers and manual appending of existing research notes and models. The separation of the models, thesis, ESG scorecards and ongoing management notes make it impossible to form a holistic historical view of all the research and analysis. Without the benefit of an all encompassing view, it is difficult to learn from the past. Additionally, when key analysts leave this is often detrimental to the existing analysts and PMs. Without a purpose built system to continually document a time-series of all the quant and qualitative analysis, the insights, methodologies and rationales; an analyst departure could mean a permanent loss in capability. Calibre Process Builder decomposes the individual aspects of your research process into artifacts. So not only can you see your ESG scorecard in real-time, you can also view how it has changed over time without having to go and find all the previous notes across various systems. Back-test and see the trajectory of your ideas and scorecards easily. Retain all the analytical outputs, ideas and rationales all within Calibre Process Builder, even if a key analyst has left the firm. To learn more about how Calibre can give you a competitive advantage with your process, click below to contact us for a meeting or a free trial.